Among Sanibel Island restaurants, George and Wendy’s Sanibel Seafood Grille offers truly outstanding service, atmosphere, and cuisine. We offer lunch, dinner, late night menu, and daily changing specials. The focus of all our menus is fresh, local, and fun. We also have a full bar with an extensive wine list, 20 beers on tap, a lot of local, domestic and craft beer bottles, and some fun and fresh, handcrafted signature drinks on our list including mojitos, martinis, and lots of other tropical craft cocktail favorites. George and Wendy’s Sanibel Seafood Grille is honored to have been voted “Best Place for Entertainment of the Islands 2017.” We offer a variety of live entertainment almost every night of the week featuring musicians locally and from afar. Our Sanibel Island restaurant is also an art gallery displaying a few of our local artists’ work that is sure to make your dining experience one of a kind. 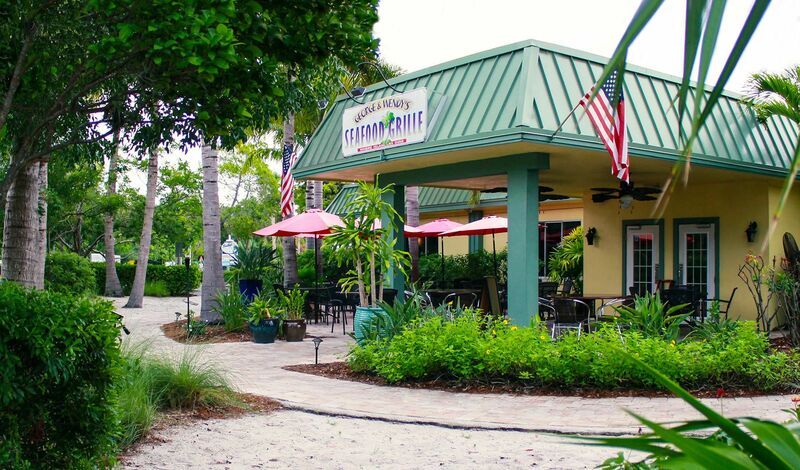 George and Wendy’s Sanibel Seafood Grille offers several dining areas to enjoy: our main dining room, garden setting patio, sports bar/lounge, and our back room dining. Each room offers its own unique experience. Home to the Chicago Bears and Buffalo Bills fans offering a round of free jello shots to bar patrons for each Bears and Bills touchdown adds to the fun. We welcome all football fans to come in and cheer for your favorite team. Our lush tropical garden patio is located outside the main entrance and pet-friendly. Enjoy lunch, dinner, and cocktails surrounded by the natural beauty of Sanibel Island. The back dining room offers more off the beat dining experience that is also available for a family gathering, corporate party, meeting, rehearsal dinner or special event gathering. George and Wendy’s Sanibel Seafood Grille is the perfect place for your next Sanibel adventure, and we look forward to making your experience with us memorable. Call us to plan your next special occasion or make a reservation for your next dining experience. We accommodate for both large and small parties. Along with our weekly Monday-Friday specials, our menu hosts an extensive list of tasty options. Our appetizers offer a perfect number of choices to get the night started. From our crispy Ahi Tuna Nachos, Fried Pickle Spears, Roasted Garlic & Brie, and so much more, the choices are almost endless! For the main course, we have even more options to choose from. At George & Wendy’s Sanibel Seafood Grille, our flatbreads are sure to please with a classic Cheese or a Buffalo Shrimp. We also offer options From The Turf, and The Surf including the Rib Eye Steak or the Piña Colada Snapper. Along with these, we offer tacos or pasta options as well as classic salads and soups. To finish off the night, choose from a selection of our delicious locally homemade desserts! For customers with special requests, we offer an extensive gluten-free lunch and dinner menu as well. We offer gluten-free flatbreads, tacos with corn tortillas, pastas served over gluten-free brown rice noodles, and wraps crafted with gluten-free tortillas. We also offer a number of gluten-free soups! Ask your waiter if our soup of the day is gluten-free! Are you the Classic, Berry Naked or the Prickly Pear type? Have fun with these! It’s Martini Time! Handcrafted and made especially to delight the senses. Enjoy our Flirty and Dirty, Cucumber Chill, French, Lemon Drop or Strawberry Fields to name a few. Was it the Old Fashion Redemption, Islander, Tropical Heat, Toasted Coconut or the Hurricane that brought you back for more? With the largest selection of signature cocktails, beer and wine menu, our Sanibel Seafood Grille has a drink to suit anyone’s taste. From specialty Bloody Marys, to Margaritas & Martinis with a twist, Mojitos, Frozen Drinks, and a number of Fun On The Rocks, there is so much to choose from! If fruity drinks are not your style, no worries! We have over 20 beers on tap including Lagers, Ales, and IPAs, as well as a number of seasonal choices as well. We also offer Wendy’s Wine List, which contains an extensive number of Red & White options. Check out the drinks menu to see our full list. Sanibel Island is a special place for George and Wendy, and they want the guests of their Sanibel restaurant to be able to relax, enjoy a good meal, have a great experience, and take in all that Sanibel Island has to offer. To add to your dining experience, our Sanibel restaurant is also an art gallery, hosting local art pieces from artists around the island!